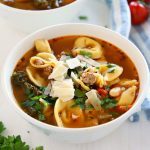 This Rustic Italian Sausage Tortellini Soup is packed with fresh, wholesome ingredients and Italian flavours. It's hearty, filling, and is easy to make! Heat a large dutch oven or soup pot over medium-high heat on the stovetop. Add the Italian sausage and cook until browned. Add the onion and garlic, fresh tomatoes, beans, spices and salt and pepper and stir to combine. Reduce the heat to medium and cook until the onions are translucent. Add the kale and continue to cook just until it begins to wilt. Add the chicken stock, cover and bring to a low boil. Add the tortellini and simmer for another 10-15 minutes, or until the tortellini is soft and cooked through. Serve with freshly shaved parmesan and a sprinkling of fresh parsley.